Relax on the beachfront at our Luxury Key West Resort Condo Rental with it's perfect location and beautiful tropical landscaping. Enjoy the ambiance created by the sound of the ocean waves as you experience the famous Florida Key's sunset from our sundeck. There are very few hotels or inns that can match what our resort has to offer. Our condo rental is not only located on the beach it also includes some of the best resort amenities to be found in the Florida Keys. Our resort accommodation features a huge world class heated pool and a beautiful sundeck area that is situated right on the ocean. The amenities and features you will experience with our resort accommodation are second to none in the Florida Keys. Our 1800 Atlantic condo comes with all the comforts of home. Our rental home features a modern fully equipped kitchen, two bedrooms, two full size bathrooms and a full size washer and dryer. 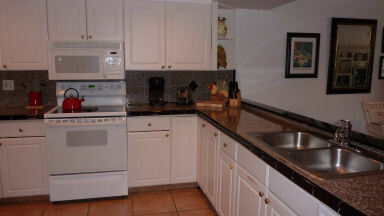 Our house rental even features granite counters in the kitchen and wet bar. You'll be hard pressed to find another condo rentals in Key West with the luxury and spaciousness that our vacation rentals have to offer at almost 1400 square feet. We are among the finest beach rentals you will find. 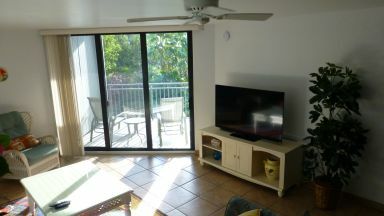 Our Key West vacation rental also features 3 sliding glass doors to our patio, one in each bedroom and living room area. 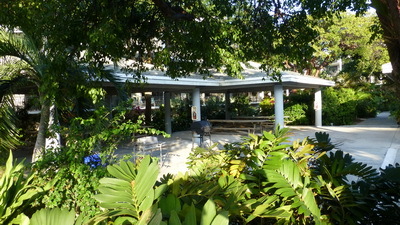 From there you will have access to the fantastic views of the tropical garden area from our private 40 foot veranda. Our accommodation has a beautiful and spacious master bath with two sink areas. Both bedrooms come with king sized beds and in addition we have a queen size pullout sleeper sofa in the living area. With our recently remodeled home rental you will even receive free high speed wireless internet access unlike the small villas or hotels who will usually charge you for their internet service. 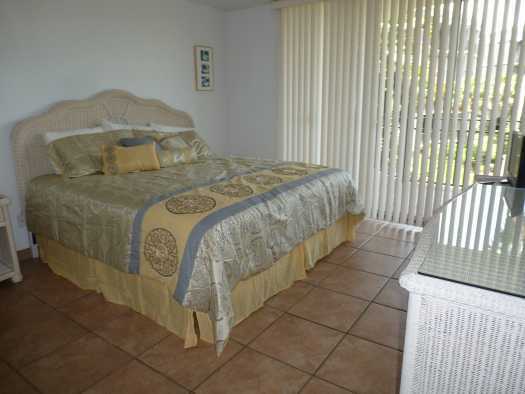 We also feature nightly, weekly, or even monthly vacation rentals. We offer discounts on our weekly and monthly vacation rentals which includes one free night with our summer condo rental special. You won't find four hundred feet of private beach area at any of the Duval Street hotels,or bed and breakfast cottages like we have at our 1800 Atlantic resort property. Our resorts beach area is also located adjacent to the most popular beach on the island, Smathers Beach. At Smathers you will find just about every watersport activity there is to offer. You can rent jetskis, sailboats, kayak rentals, paddleboards and many more. Smathers is also the most popular spot for Key West parasailing, with rates starting as low as $29 for a morning flight. The island is known for it's premium on finding parking spaces. Parking is not a problem with our vacation home rental. Our condo even comes with a reserved parking spot in our buildings indoor garage. With our condo you will have access to any of the resorts tropical landscaped barbeque huts where you can spend a peaceful evening cooking out doors and enjoying the warm tropical breeze. Our Luxurious Resort Accommodation features 24 Hour Security Personel. Our condo rental features a huge 55" TV with internet wifi. The 1800 Atlantic resort property even has a banquet facility for any special occasions or that perfect Key West beach wedding. We are also one of the few resorts in area that has 24 hour security personnel for your safety and convenience. 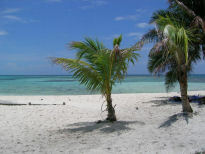 Very few Key West condo rentals that can compare with the amenities our beautiful resort property has to offer. 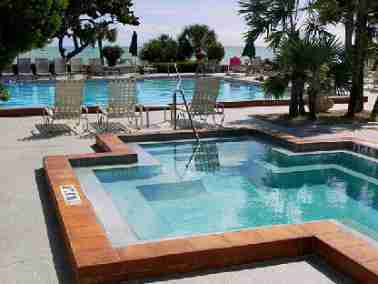 The resort is highlighted by our world class olympic sized heated pool which sits right on the beach. The ocean front pool offers unbelievable ocean views! You also won't find a jacuzzi at any of the inns or hotels with a twenty plus capacity like our resort has to offer. Our luxury resort property also includes racquet ball, saunas for both him or her and 3 lighted tennis courts, including one constructed of clay. At the end of your stay our resort accommodation will leave you yearning for yet another trip back to our tropical paradise. 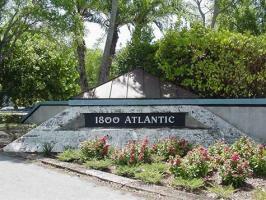 1800 Atlantic Vacation Rental - Additional Condo Amenities Included. 55" TV with Internet Wifi.